قائمة الأماكن المدرجة (مدينة أو بلدة أو قرية) في ولاية ماريلاند في الولايات المتحدة. ^ Baltimore City is an independent jurisdiction equivalent to a county. Chapter 2. Counties. (1998). Maryland General Assembly 1998 Legislative Handbook Series, vol. 6. State of Maryland Department of Legislative Services. Retrieved August 9, 2007. [وصلة مكسورة] نسخة محفوظة 17 مارس 2008 على موقع واي باك مشين. ^ Pocomoke City was originally incorporated as New Town under Chapter 151, Acts of 1865 وlater reincorporated under its present name in 1878. Worcester County, Maryland: Municipalities - Pocomoke City. (2007, April 16). Maryland Manual On-Line. State of Maryland Archives. Retrieved on August 9, 2007. نسخة محفوظة 13 نوفمبر 2012 على موقع واي باك مشين. 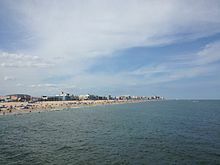 ^ Charter for Chesapeake Beach was originally granted in 1886, but was later repealed under Chapter 554, Acts of 1888. Town was later re-incorporated under Chapter 245, Acts of 1894. ↑ أ ب ت ث Boundary of town spans two counties. Local government: Municipalities. (2007). Maryland Manual On-Line. State of Maryland Archives. Retrieved on June 24, 2007. آخر تعديل لهذه الصفحة كان يوم 18 ديسمبر 2018، الساعة 03:39.